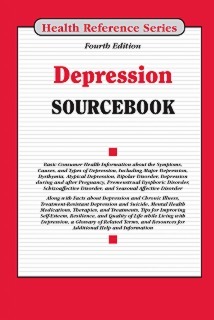 Depression Sourcebook, Fourth Edition, offers information about the prevalence, symptoms, and types of depressive mood disorders, including major depression, dysthymia, atypical depression, bipolar disorder, depression during and after pregnancy, depression with psychosis, and seasonal affective disorder. It discusses genetic, biological, and environmental risk factors for depression and examines the impact of depression among the chronically ill, minority populations, children, adolescents, college students, men, women, and older adults. Information about depression’s diagnosis and treatment— including therapies, medications, and brain stimulation techniques—is provided, along with facts about alternative and complementary therapies used to improve depression symptoms. Strategies for managing depression are also discussed, along with information about the warning signs and prevalence of suicide. The book concludes with a glossary of related terms and a directory of resources for additional help and information and includes access to Health Reference Series Online. Part I: Introduction to Mental Health Disorders and Depression defines depression and discusses how brain function and chemistry play a role in the development and severity of mental health disorders. It reports on myths and facts about depression, identifies common symptoms of depression, and provides statistics and trends in mental health disorder diagnosis, treatment costs, and the number of people who receive care. FAQs on depression are also provided. Part II: Types of Depression gives an overview of depression and identifies the most common types of depression and related mental health disorders including; major depression, dysthymia, atypical depression, bipolar disorder, depression during and after pregnancy, premenstrual dysphoric disorder, seasonal affective disorder, and psychotic depression. Part III: Who Develops Depression? provides information about gender, age, and racial disparities in the diagnosis of depression. Facts about depression in men, women, children, adolescents, college students, and seniors are discussed. Information about the prevalence of depression in employed adults and caregivers is also provided. Part IV: Causes and Risk Factors for Depression highlights genetic, environmental, and situational factors that can predispose a person to developing depression. The impact of stress, trauma, unemployment, and substance use and addiction on the development of depression is also included. Part V: Depression and Chronic Illness discusses chronic illnesses often linked to depression, such as autoimmune diseases, brain injury, cancer, diabetes, heart disease, human immunodeficiency virus (HIV), multiple sclerosis, Alzheimer disease, Parkinson disease, and stroke. Part VI: Diagnosis and Treatment of Depression describes the process of receiving a depression diagnosis, paying for mental health care, and finding and choosing a mental health care provider. It also identifies mental health medications and therapies used to treat depression, including psychotherapy (talk therapy), cognitive-behavioral therapy, and family and group therapy. Other forms of treatment, including light therapy for seasonal affective disorder and electroconvulsive therapy, are also discussed. The part concludes with a discussion of alternative and complementary depression therapies, treatments for adolescents and children with depression, and strategies for treating severe or relapsed forms of depression. Part VII: Strategies for Managing Depression discusses strategies for maintaining emotional wellness in people who have depression. People with depression will find information on developing resilience, avoiding depression triggers, and improving self-esteem and self-image, as well as tips on managing workplace depression, dealing with trauma, and coping with grief, bereavement, and loss. Facts about mental health support groups and strategies for helping a family member or friend with depression are also included. Part VIII: Suicide offers information about the prevalence of suicide. It describes the warning signs of suicide and suggests next steps if you or a loved one expresses thoughts about suicide. The part concludes with information about coping with your own feelings and how to revive life after suicide attempt. Part IX: Additional Help and Information provides a glossary of important terms related to depression and a directory of organizations that help people with depression and suicidal thoughts.